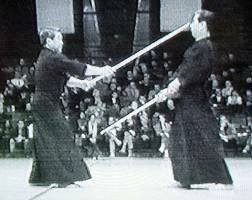 Jodo is the way of the Jo, or wooden staff. 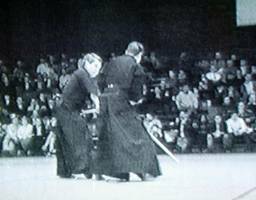 The most practiced form of Jodo today is the training set adopted by the Zen Nihon kendo Renmei known as Seitei Jo. 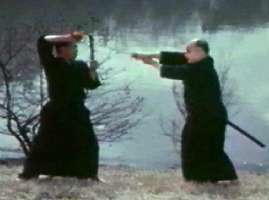 While developed in the late 1960's, seitei jo is derived from the jo techniques of Shindo Muso Ryu. This koryu or old tradition, which includes a variety of weapons (jo, ken, kodachi, nito, tanjo, jutte, tessen, kusarigami, ...) was founded around the end of the 16th century by Muso Gonnosuke (Katsuyoshi), a student of Katori Shinto Ryu and Jikishinkage Ryu. Very little concrete information is known about the life of this person. Most accounts associate his invention of the jo-sized staff techniques with an encounter and a subsequent vision. The encounter was with the famous swordsman Miyamoto Musashi (Shinmen Musashi No Kami Fujiwara No Genshin), founder of Hyoho Niten Ichi Ryu and author of the Gorinnosho (the book of five circles). Much legend has accumulated around these men and their encounter, so we will likely never find out what actually happened. One of the less plausible but most often repeated stories has Muso and Musashi meeting for a duel, the first with a long (six shaku) bo, the latter with his trademark two swords. Muso swings to Musashi's head, who blocks in jujidome (an overhead x-block). "Kusou, why didn't I think of that?" says Muso, and he goes off to sulk, but suddenly gets an idea. He shortens his stick and hurries back to Musashi. "Watch this, Miyamoto!" he shouts as he swings again to Musashi's head, who obligingly blocks again in jujidome. However, thanks to the shorter stick, Muso is able to hit Musashi in the plexus with the other end. "Got ya! Bwahahahaaa!" And thus a new koryu was born. 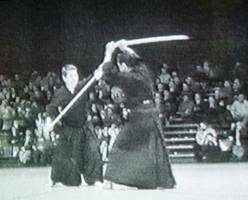 Unfortunately for this interesting story, two of the oldest accounts of the meeting between Muso Gonnosuke and Miyamoto Musashi have Gonnosuke attacking with a wooden sword, not a staff, and Musashi defending himself, not with two swords, but with a short twig he was carving into a toy bow at the time. According to other stories, Gonnosuke concluded that swords hurt people but sticks would not. To develop this idea, he confined himself to a holy temple, Homangu, the training centre of the ascetic mountain Sect of Tendai, where he received the revelation on the true nature of the round stick. Most traditional Japanese weapons are meant to kill or to cause serious injury. One can, however, use a jo to subdue an opponent without causing permanent damage, while still remaining capable of dealing with more "deadly" weapons, and overcoming them if need be. The jo can also be used to lethal effect, so there's a great degree of flexibility in response. Common jo techniques are thrusts against the face or the plexus solaris, and overhead blows against opponents' head or hands. Gonnosuke is said to have combined swordsmanship and the art of the yari and naginata into Shindo Muso Ryu Jojutsu. The sticks have a diameter of 8 bu (2.42 cm), and a length of 4 shaku, 2 sun and 1 bu (127.6 cm). One can strike and thrust using both ends. A flexible length can be obtained by sliding the jo and by changing the position of the hands. 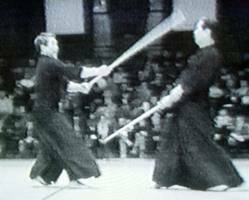 Because these are "real" weapons and very dangerous if used improperly, the jo doesn't have a training method or competitive aspect where one uses protective equipment and engages in freestyle sparring with a mock weapon as in kendo and naginata. One trains only through the use of kata (pre-arranged formal training exercises). This may sound a bit dull, but it is certainly an effective method for learning the essential elements of distance, timing, trajectory, and awareness. After developing his art, Gonnosuke became the teacher of the Kuroda clan, and Jojutsu was one of the most secretive arts of the period. Permission to teach outside the han (feudal territory) was not granted until 1872 after the Meiji Restoration had taken place. 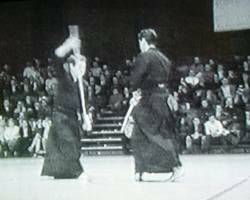 In the 20th century Takauki Shimizu changed the name of the style to Jodo, and developed the 12 kihon (basic exercises) as a training aid. 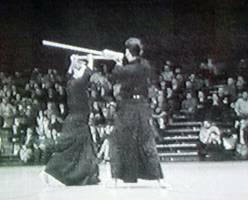 The Seitei Jodo described below was developed by the Japanese Kendo Federation after a demonstration of this modernised Shindo Muso Ryu Jodo. TSUNE NO KAMAE: this is the basic kamae from which other kamae are developed. Stand in natural standing posture and hold the jo at the half way point down by the right side, with the point of the jo at the height of one�s own navel. 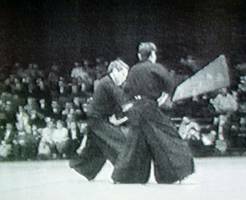 HONTE NO KAMAE: From Tsune no kamae the right hand and leg advance at the same time, the left hand takes hold of the rear end of the jo. Then the right hand is then withdrawn to a point about a quarter of the jo�s length from the rear end of the jo, the front end of the jo being at eye level. GYAKUTE NO KAMAE: From Tsune no kamae, the left hand takes a reverse grip on the front end of the jo. As the the right foot is advanced, the right hand makes a large circular sliding along the jo to grip it at a point about one quarter of his length from the left hand. The front end of the jo is at eye level. When taking this kamae, the back of the right hand should be vertical. HIKIOTOSHI NO KAMAE: From Tsune no kamae the left foot is pushed well forward and at the same time the front end of the jo is held in an overhand grip between the base of the indexfinger and the thumb of the left hand. Turning the body to the left shizentai (hanmi = sideways) posture, bring the left hand to the region of the left breast. The grip of the right hand is changed to hold the jo from beneath. In this kamae the palms of both hands are facing out. HONTE UCHI This technique is intended to meet an opponent�s attack by striking him between the eyes. 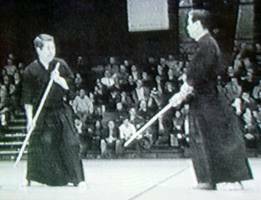 GYAKUTE UCHI The purpose of this technique is to meet an enemy�s attack with an offensive technique by striking to the left or right side of his head. HIKIOTOSCHI UCHI This technique intended to attack an opponent who is holding a sword in seigan no kamae by striking his sword down. 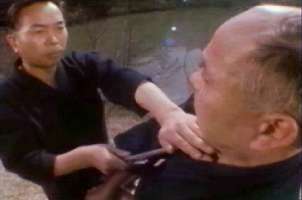 When practised without an opponent, the strikes are to the face. KAESHI TSUKI Using a twisting action of the hips to the right and left, the front and rear ends of the jo are rapidly changed to enable a trusting technique to the opponent�s suigetsu (solar plexus). GYAKUTE TSUKI From the reverse hand position, trust at the opponent�s suigetsu, then follow with honte uchi strike to his face. MAKI OTOSHI This technique intended to stop a cut to the head. The tachi, having been blocked, is swept aside in a circular movement which finishes by attacking the opponent�s face. 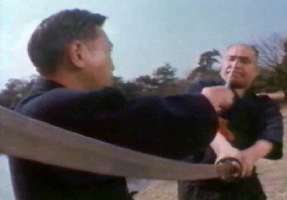 KURI TSUKE As the opponent cuts to the center of the head, the body is moved to the left. 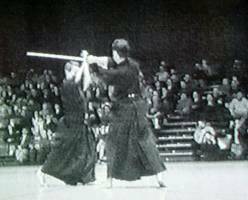 The front end of the jo is gripped with the left hand and with a powerful upward sweep, the tachi is caught and manipulated back to the opponent�s own lower abdomen. KURI HANASHI In the same way as with kuritstsuke, this technique is designed to catch, manipulate and thrust away a cut to the center of the head. TAI ATARI The begin of this technique is the same as for kuritsuke. Then this is followed by a body check technique where the left fist is pushed into the opponent�s suigetsu, and the right fist pushed into his face. 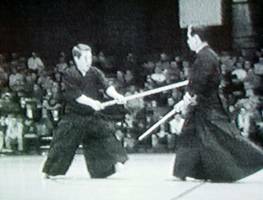 TSUKI HAZUSCHI UCHI The opponent attacks with a thrust to the body. The jo is held at full length as it is raised above the head. The body is drawn backwards to receive the trust with the jo and the bokuto is immediately struck down. 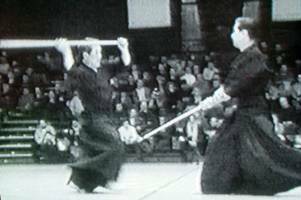 DOBARAI UCHI In response to a cut to the right side of the chest, the right foot is withdrawn and the cut received on the jo. The bokuto is immediately struck down. MIGI TAIHAZUSHI UCHI - HIDARI TAIHAZUSHI UCHI In response to a cut to the center of the head, the body is moved back to avoid the cut, and the bokuto is immediately struck down with the jo. This technique can be performed either to the right or to the left. Uchidachi takes bokuto in other (right) hand, a hand's width below the tsuba, edge towards himself. 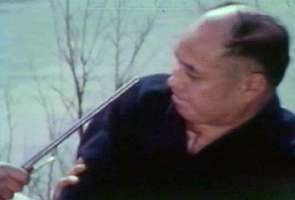 Shidachi accepts bokuto with the left hand below the tsuba. Uchidachi takes the jo with the left hand (and becomes shidachi from now on). Uchidachi (holding bokuto) takes one step to the left and turns the bokuto so the edge points toward himself and brings it to normal carry position while stepping past shidachi, who transfers the jo to his right hand, and steps forward on the same line (uchidachi moved aside to let shidachi pass). Arriving at the starting position, uchidachi lowers the bokuto (straightens arm) and turns around right. Shidachi turns right in the usual fashion when arriving at his position (point jo to floor, turn right). 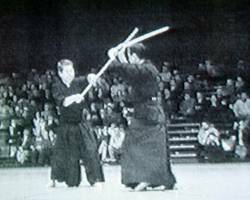 Without stopping in seigan no kamae, Uchidachi brings the bokuto to the hip in one circular motion. It is then lowered, and the thumb is not placed on the tsuba. Shidachi points jo to the floor (at "sogono"). 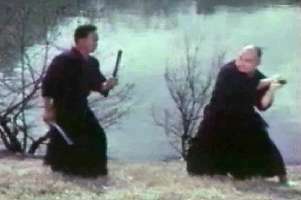 The end of the jo (lowest in tsune no kamae) touches the right shoulder from behind. It should not be seen protruding above the shoulder. Shidachi and uchidachi bow simultaneously (at "rei"). Shidachi must take care to keep the jo pressed against the shoulder. After bowing, Uchidachi returns the bokuto to the hip and replaces the thumb on the tsuba. Jodo Kyohan by Kaminoda Tsunemori and Nakashima Asakichi. Edited by Shimizu Takatsugu. This is an almost complete manual of Shinto Muso Ryu Jodo. It is 352 pages long, and has over 2000 photographs, detailing all of the techniques up to Menkyo (no tanjo, jutte, etc. though). 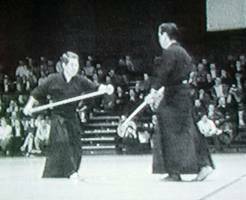 Yoneno Sensei and Hiroi Sensei are both 9th dan Hanshi of the All Japan Kendo Federation. Their book shows them demonstrating every part of the All Japan Kendo Federation Jodo Seitei Kata. 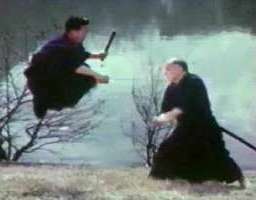 It starts with the basic postures for holding the jo, and then moves through the basic solo techniques, paired practice of the basic techniques, and finally the Jodo Seitei Kata. Yoneno Sensei and Hiroi Sensei personally posed for all of the pictures in this excellent book. Some images on this page are from the video 'Martial Arts of Japan' by Michel Random- current availability unknown. There was an accompanying book, now out of print.